Just woke up from my after-dinner nap. Haha. I know it’s bad to sleep after dinner, but I had a massive headache. Spent a day at home from Saturday afternoon to Sunday afternoon. Less than 24 hours, actually. But I was happy to go home, because my dearest sister, Elaine, is back from Dundee, Scotland! She’s been there for a year, so I’m really so happy to see her again! 🙂 Daddy’s home too. We went home together from Singapore on Saturday, after his flight from Surabaya (where he is now working). Anyway, the journey back to Singapore this afternoon was terrible. The sun was high up in the sky. I waited at the bus stop from 1pm all the way till 1:45pm before the bus arrived. When I reached Gelang Patah, where we had to change a bus, at around 2:15pm, we waited for another 30 minutes before the bus started to move off. What’s worse is that at Gelang Patah, this old lady and this middle aged lady boarded the bus, and sat opposite me. I was trying to sleep, despite the heat, or at least, just rest, but their sharp piercing voices penetrated my personal space constantly, with their loud chatter in Hakka! Omg. I was super irritated, as you can imagine. I kept throwing them dirty looks, and was even tempted to shush them. But they didn’t sense my irritation at all. So I had to endure it all the way until I reached Jurong East Interchange at 3:30pm. Somehow, even after I changed my seat after going through the immigrations at JB and Singapore, they still managed to find a seat near me. I tried to sit somewhere far away from them, but they always came to sit near me. Argh. By then, I got that massive headache already, due to the sun, and the piercing voices that continued non-stop with their Hakka chatterings. Disclaimer: I’m not against Hakka people – I’m 100% Hakka, since both my parents are from Hakka families too. I just can’t stand the dialect. It sounds ugly, imho. Got home at 4:15pm, and popped a strong painkiller. The headache didn’t go away though. But it got better when I met up with Baby later. We went to a restaurant near my place. It’s called Beijing Folk Restaurant, or 北京人. Haha. I asked BB to order whatever food he wanted, and, as expected, he over-ordered! Don’t be deceived. This is not all! We still had one more dish. Anyway. 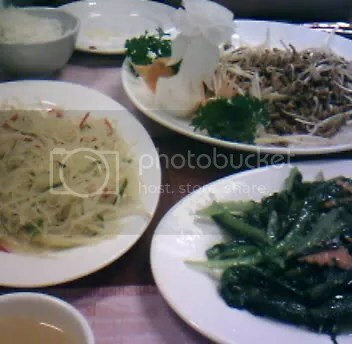 Clockwise from top-right corner: Minced meat with spring onions, stir-fried vegetable, and sour-spicy potato. All these food were quite new to me. There was one more dish, seasoned vegetable with noodle soup. Yummy yummy. We ate till we were so full, and there were still food left over – so we asked them to pack up the leftovers for us. BB said he didn’t know that the portions were so big. But still, I thought ordering 4 dishes for 2 persons was abit extravagant. Oh wait, there were actually 5 dishes, but we cancelled one of them after we realised the portions were so big! The final bill came to $32, but it’s alright if it’s being shared by 4 persons. The amount of food was certainly enough to feed a party of four. Overall, I think the restaurant is really good. They are having 20% discount on all the dishes now, so you guys can check it out, for real authentic Beijing food! Even my BB, who’s from Beijing, said that he wished he could eat there everyday. Heh. Go try, go try! 🙂 Reasonable prices for great food. Service is pretty good too – the orders didn’t take long, and the people were quite nice. As far as I’m concerned, BB only has one flaw: He loves his gadgets too much! Though I’m quite a gadget-loving girl too, his obsession is still way too much for me. He tends to get so engrossed in them. But well, I still love him as he is, gadgets and all.